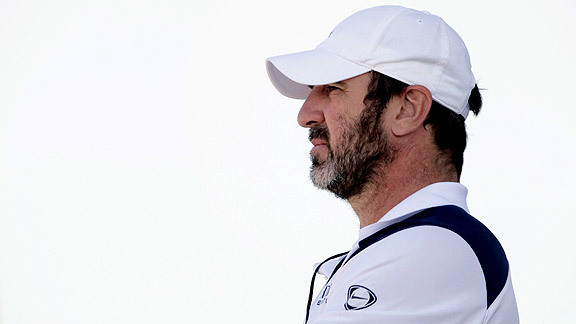 Vincent Beaume/AFP/Getty Images Eric Cantona is all business about his new gig as director of soccer for the Cosmos. We were all Eric Cantona on the playground. We'd puff out our chests, take improbable shots and pop our collars, the way he did, standing proud amid whatever maelstrom he'd created around himself. We adored King Eric. From the day England first laid eyes on the French forward -- tellingly nicknamed Dieu -- when he was with Leeds United in 1992, to his time with Manchester United and even now, Cantona has been worshipped. He was both soccer aristocracy and a working-class champion, the ultimate cult hero. Beloved for his heroics as well as his antics. Beloved ferociously and unconditionally. You could even make a movie about a man's devotion to the memory of Cantona, in which the King himself dispenses cryptic advice as a figment of the protagonist's imagination. It's hard to turn down that kind of magnetism. And so the reincarnated New York Cosmos didn't. The long-defunct NASL club hoping to join Major League Soccer by 2013 recently made Cantona, now 44, its director of soccer. But is the man behind the charisma compatible with the Cosmos' operation and its lofty goals? Interviewing Cantona is a surreal exercise. Partly because he's shunned the media all his life; partly because his eccentricity has made him one of the sport's few bona fide legends. Cantona himself often leaves us with more questions, not answers, when he pops into the public sphere. But he is outgoing and disarmingly arrogant. (Me: "Why would the Cosmos come to you, Eric?" A grinning Cantona: "Because I am the greatest!") Between a charcoal beret (bill forward) and an olive-green collared designer sweater (collar down) protrudes a set of wide, dark eyes. People advise against meeting your heroes, as you'll too often be left crestfallen when image and reality don't line up. But Cantona is exactly as you would expect and want him to be. His voice is still husky, his hair still cropped and his signature beard still guards his jaw, albeit with a big patch of gray. And Cantona wants you to know that he has big plans for the Cosmos. He wants to build from within, on the strength of the two academies the club already has up and running in New York and Los Angeles. Unlike the old Cosmos, not to mention soon-to-be neighbors New York Red Bulls, the new Cosmos won't build around aging, imported stars. "I think the Red Bulls will have much more things to learn from us than we from them," Cantona said. New York Cosmos Cantona wants to build the Cosmos like Barcelona, using homegrown players from its academy. His model is Barcelona, which has conquered the world with homegrown players from its academy. But, said Cantona, "We'll do it in our own way. I have my own ideas, but they're a bit secret." Cantona hopes to have the core of a first team emerge from the academy in five years' time and a side that is entirely homegrown not long after that. Lofty aspirations, but he's thinking even bigger. "The [goal] will be for the United States to win the World Cup with Cosmos players," he said. "I think in 20 years' time. Maybe before." If that sounds outlandish, consider that the Cosmos already have three youth products in U-17 national team residence in Bradenton, Fla. That's more than any academy of a current MLS team. Still, an entire homegrown team might prove a stretch. "It's extremely ambitious and also I would think somewhat foolish to think this could be a reality. That's a utopia," said former MLS and current U-20 national team coach Thomas Rongen, who played under Rinus Michels and with Johan Cruyff, the two men credited with conceiving and developing Barcelona's academy. "Even Barcelona can't do that and still needs help from the outside. "It's a really good thing the Cosmos are trying to do, but it's nearly impossible to do it if you want to be competitive," Rongen added. "And it makes you feel Eric Cantona doesn't really have a good feel for grassroots football in this country. Great idea. I love it. But it's not attainable." Then again, Cantona wasn't going to come back to the game for any ordinary job. The only soccer-related job he's had since he retired as a player in 1997 was as a member and then manager of France's national beach soccer team, which he led to victory in the inaugural World Cup in 2005. "For him to have come out of not being in football for 14 years, it took something pretty special," said Cosmos vice chairman Terry Byrne. "I didn't want really to be involved in a normal soccer club," Cantona said. In truth, Cantona wasn't even really looking for a way to get back into soccer. There would be no point anyway, he argued. "It's like when you want a girl. If you search them, search the girl everywhere, they feel it. And then they don't want you. You have to let them come to you. It's the same for football clubs." In signing Cantona, the suspicion may arise that the Cosmos are pulling a bit of a publicity stunt. There's certainly been more buzz surrounding this fabled club than there is around most MLS sides. But the man insists he is no figurehead. He will be in charge of player policy "from the academy to the first team -- everything," he said. "He definitely adds cachet to the club," said Byrne, David Beckham's former right-hand man, who hired Cantona. "But [the decision was based] more on a list of achievements, rather than going after the mystique." "We're not a brand," said Byrne, rejecting an oft-heard characterization of the reborn but squad-less and league-less Cosmos. "We're a soccer club." Cantona was hired on the merits of his vision, not his past, according to Byrne. "We needed somebody that could oversee all aspects of the football side, who has played the game at the highest level, has won everything at the highest level and knows what it takes to create that in the future," he said. "I traveled the world and interviewed four candidates and the one that impressed me most in terms of what his vision would be for this was Eric." When I retired, I didn't want to watch the game because I loved it so much. It would be like you are on drugs and you go meet your dealer. It's better to stay away. But why a man who has been out of the game as long as he was in it? Cantona said he didn't watch any soccer in his time away, not even on TV. "When I retired, I didn't want to watch the game because I loved it so much," he said. "It would be like you are on drugs and you go meet your dealer. It's better to stay away." "What makes him different is that he thinks differently," Byrne said. "He'll think out of the box. That's part of what attracted me to bringing him in. I know that given the opportunity, he would view this as something completely different to the traditional." To compensate for Cantona's lack of knowledge of today's players, let alone the American game, the club has hired Cobi Jones, the all-time U.S. cap leader and a onetime assistant coach for the Los Angeles Galaxy, to work by his side and bring him up to speed. "I don't very well know the game here," Cantona said. "But it's why we have Cobi. He teach me." Working with Cantona has been "a great time, so far," Jones said. "He's very mellow, but still a very strong-willed person. He isn't so far out there that it's a shock or anything. "There's obviously quite a few things that he'll have to pick up," Jones added. "MLS is very different from anything overseas. It's going to be a huge commitment time-wise to learn the ins and outs of the game, not just the rules and regulations, but the American player and his psyche." Cantona plans to regularly take in MLS games. And he's already been out to the club's academies to check on the progress of its 8-year-old players. "Anyone who flies back and forth from Europe to visit the academies," Jones said, "is a dedicated person." But big plans, good intentions and an able sidekick don't necessarily equate to being the best man for the job. "Does it make me nervous?" Byrne asked. "No. We've entered into a long-term [three-year] contract with him and I foresee he will be involved with the club a lot longer than that. What he achieved while in the game [helping transform Manchester United from a big club into a powerhouse] was far greater than most added together." Yet history has demonstrated that a pedigree in Europe, no matter how big, seldom translates to success in the U.S.
"Many good men have failed here," I told Cantona. "Until I arrived," he said with a wink. But what if he gets bored again, the way he did with playing soccer and with acting? "In general, yes, I get bored easily," Cantona said. "It's why I organize my life to try to do many things so I enjoy all time and every day." That's also why he's moving on to a career in soccer administration. After finishing up as a player, he threw himself into acting, amassing 20 credits. But he's gotten enough acting out of his system to pursue it only as an offseason diversion. "I think it's better to be involved in one or two movies a year," he said. "Desire is important." 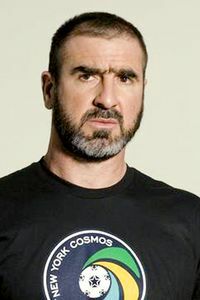 The plan is for Cantona to finish up his outstanding acting obligations while he prepares for his job with the Cosmos. He will shoot a French movie this summer and head to Seattle to act in a play in October. When that ends in April 2012, he will move his wife and three children to New York City. From then on, he will work for the Cosmos from the middle of March through November and act in France during the winter. What about the offseason? "I can work by phone," he said. "And it's too cold in New York. I think the most important thing is to be there during the preseason and the regular season." Otherwise, he said, "I don't need to be with people. I can be in the countryside or at home and stay a few days without seeing anybody. I am with my dreams, my mind, my imagination."